Chronology (PC) – Video and Review! Chronology is another one of those games I’d never heard of before being contacted about it, and it was developed by a company I’d also never heard of before. Yet, it’s one of those games that spending five minutes online doing a bit of research instantly got me intrigued about, and although I had to put it on the virtual shelf for about three weeks after being given a review code for it, it’s a game I’m quite pleased with finally playing. Chronology is set sometime in the future, according to the game’s intro, in a rather steampunk type of setting. In that time, a large society called Metropolis existed and received most all of its power from Vapor – a substance emanating from the Earth itself. However, something happened at some point, and the world as it was known was largely destroyed. The main character, referred to in-game as the Inventor, knows that he had something to do with this, but doesn’t know exactly what happened. He wakes up in a dismal-looking forest with the ruins of society all around him, and it’s up to him to piece things together. Minutes into the game, players will find a pocket watch, but this isn’t just any normal pocket watch. This watch has the ability to reset time to before whatever disaster occurred. On some level, this would seem significant in piecing together what happened, but from a gameplay perspective, it’s so much more. For those of you who may have played Sonic the Hedgehog CD on the Sega CD (or in one of its re-released formats), you may have a basic appreciation for the time-travel mechanic; here, you need to constantly change to the future and back again in order to progress through the environment. Sometimes, this is something simple, like a bridge being out in the future but being present in the past, but might be something more complex, such as needing to plant a seed in the past and then using the vine created in the future to climb a cliff that was previously inaccessible. There are even tricky jumps that must be made where you’ll need to swap time mid-jump in order to progress! Time travel isn’t the end of the quirky gameplay mechanics though. 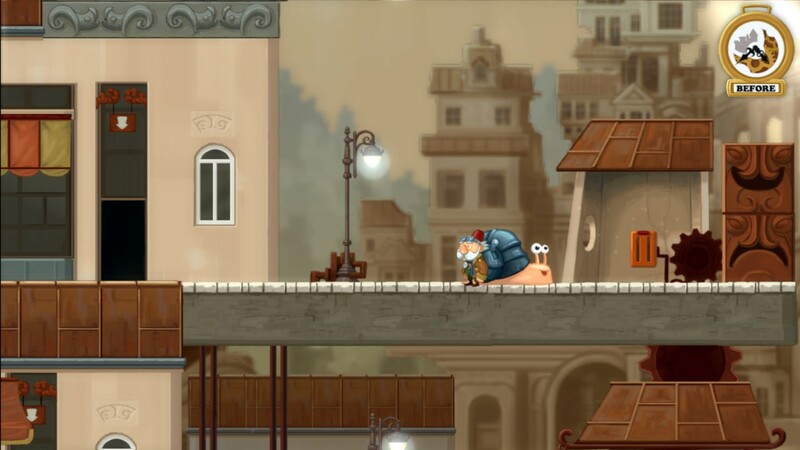 A little bit into the game, the Inventor meets a talking snail who can not only be used in a bind as a step-stool to climb higher than usual, but has the ability to freeze time. There are many instances where this is actually key to progressing. Likewise, the fact that the snail can hit a switch and then be recalled at will to the Inventor’s location allows you to do things you would normally have no hope of doing. The game’s story is told through brief dialogues and short cutscenes as you progress through the game, and this little story does make you want to keep playing in order to find out how it all resolves. Despite all of these great things about the game (including its very nice soundtrack), the game is not without a few bugs (there were times when I got stuck and almost had to reset the game to continue), and, in my opinion, it’s quite short. In the video I’ve provided along with this review, I completed four of the game’s eight chapters and made it a good ways into the fifth, all in under an hour’s time. While there’s nothing wrong with a short game by any means, the game’s length has me questioning its price tag on Steam. Is the game good enough to warrant the money? In my opinion, yes. But other people may have their own prioritization when it comes to this. The game was initially $14.99, but has been reduced to $9.99 on Steam. This is a better price point, I feel, but some may still find it a steep barrier to entry given the overall length. Get the game on Steam here, and check out the team’s official site along with their Facebook, Twitter, and YouTube pages.